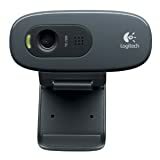 Logitech HD Webcam C270-making HD video calling simple. This simple webcam features an adjustable clip. It can attach to the monitor of your computer, right where you’re already looking or anywhere you please. It features 3.0 megapixels, up to 1280×720 resolution with 30 FPS and plugs into a USB port. When delivered in non-retail/bulk packaging, Logitech devices do not come with a driver CD or an instruction manual.